The challenger banking battlefield is crowded, with new players coming into the marketplace every week. With the geographic and product scope of most new fintech challengers being limited, and venture capital being more selective, is consolidation inevitable? By Devie Mohan, Co-Founder and CEO of Burnmark. The challenger banking industry has successfully disrupted the products, processes and go-to-market strategies of traditional banks over the last four years, with early challengers like Simple, Fidor and Starling, having found established funding as well as target markets in the past few years. There are currently over 100 challenger banks globally, and new banks continue to be launched every month. In the past six months, we have seen several major announcements in the space like the launch of UBank (from National Australia Bank), and the major investment from Sun Life into Vietnam’s Timo bank. At the same time, Starling Bank has made several announcements, including the launch of its current account, its entry into Ireland, the incorporation of a spending insights tool, and partnerships with Vocalink, Bankable and Transferwise in just the past 3 months. In such a crowded and fast-moving industry, the traditional rules of analyzing and segmenting banks (or fintech firms) do not apply. There are several dynamics including the regulatory environment, ease of getting a license, ability to find long-term investment, speed of launch of products, ability to reach the consumers on a mass scale, a B2B versus a B2C business model, and the level of support for an API ecosystem that will determine the success or failure of the challenger bank. There are several reasons why the future of the banking industry could be driven by consolidation and cooperation between fintech challenger banks themselves, and between traditional and challenger banks. The largest challenger bank in Europe today is N26 with approximately 300,000+ customers and several challengers are catching up to this number. 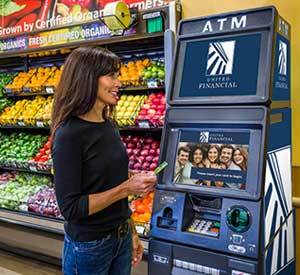 The challenger banks are vying for similar demographics (the Millennial segment and students) and with similar go-to-market strategies (targeting those who are unhappy with traditional banking apps). This model will increasingly make it difficult for any individual challenger bank to achieve significant scale and to compete effectively with large traditional banks. 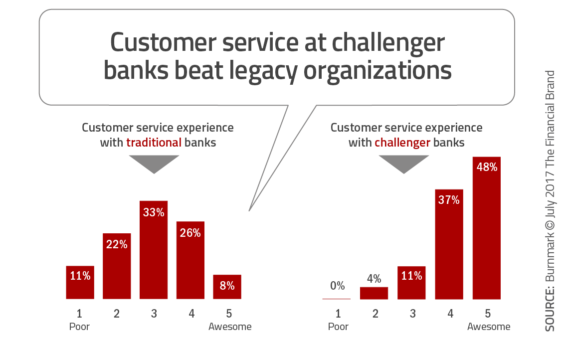 Burnmark’s primary research also showed that challenger banking users are not fully loyal yet – most will stay with the challenger bank until their customer service expectations are met. In such a finely segmented demographic market, traditional banks will be looking to partner with challenger banks for their digital customer acquisition strategies, and challengers will be looking to partner with traditional banks for their extensive customer base, large-scale marketing, access to capital and product diversity. The most interesting strategies from challenger banks involve targeting the banking needs of traditionally under-served, niche segments like students, freelancers, small businesses, refugees and immigrants. Several challenger banks had an urban focus as well. Challenger banks are proving that there is viable and commercial sense in targeting niche segments that were not traditionally profitable for the big banks. 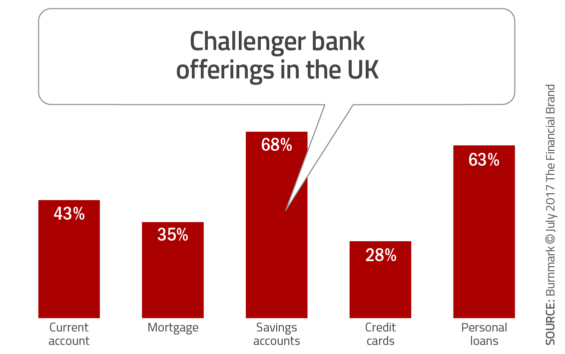 Burnmark research showed that the most valuable features for challenger bank users were the ones that offered something specific, like pocket money management for children, ability to transfer money from an international destination into a student account, or the ability to track the money spent on a local water bill. At the end of the day, what challenger banks are selling efficiently is the digital banking “experience” which is a valuable and extremely useful need for most traditional banks. For the most part, they seem to be delivering on that promise. Collaboration on experience could be one reason why consolidation or partnerships make sense in the banking industry in the future. Several of the research respondents spoke about how they are not able to get all their financial needs satisfied from one place if they are banking with a challenger bank. They expected insurance and financial advice to be present alongside a savings or checking/current account. Mortgages and wealth management, not so much. Roughly half of challenger banks today offer only basic products like savings and checking/current accounts – and this is a gap that can be successfully filled with collaboration within the space. SoFi acquired Zenbanx for its presence in banking and money transfer services, thus potentially creating a formidable challenger bank. While SoFi has since moved away from this investment, there are several other banks-as-platforms emerging globally, with product partnerships being one of the hottest go-to-market strategies in the challenger banking space. 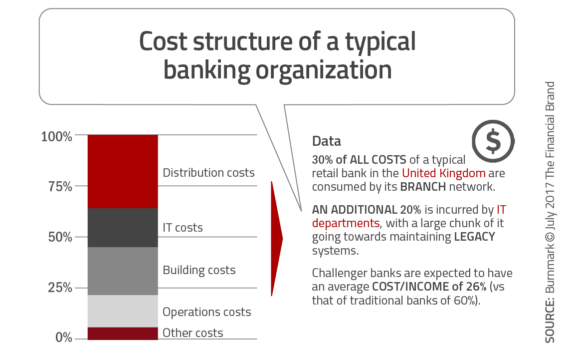 The biggest challenge any large banking operation faces today is costs – finding operational efficiency in its decades’ worth of legacy systems and non-strategic investments in outdated IT systems. The biggest desire for a traditional bank in today’s world of heavy fintech competition is to build digital technology from scratch, focusing on openness, transparency, efficiency, low costs and with the ability to future-proof disruption. The desire to use a challenger bank as a new foundation (either as a subsidiary or as an acquisition) gives traditional banking organizations the opportunity to play in more or less the same market, but leveraging disruptive technologies. 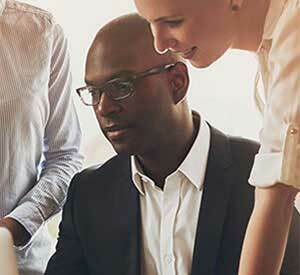 It gives them the opportunity to innovate faster and use the learnings to improve legacy operations. Both traditional banks and challenger fintech banks are using digital technology as an important component of their operational strategies. 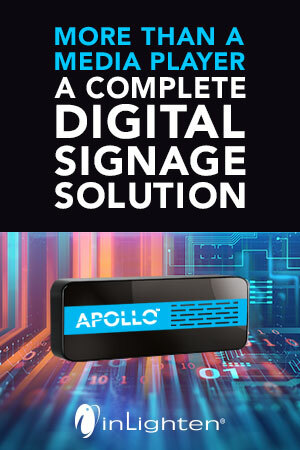 Digital technology is used to acquire and retain customers as well as to find cost efficiencies. For example, most traditional banks are experimenting with chatbots as a means to improve internal and external components of customer service. 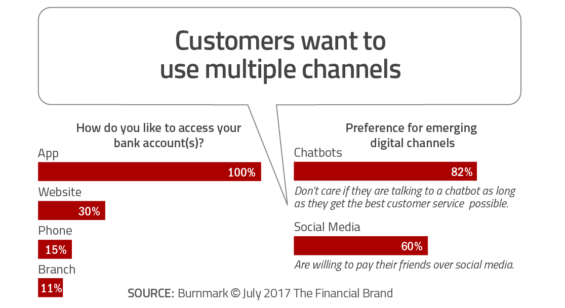 The Burnmark research shows that 82% of bank customers do not care if they are talking to a bot or a human as long as the customer service is accurate, effective and engaging. Digital integration of customer service strategies will significantly reduce the costs for legacy banks by eliminating the need for physical branches, large call centers and face-to-face advice. Most of our respondents also found the traditional banking apps lacking, leading the research to predict challenger banks being acquired just for their effective use of digital channels. One way or the other, most challenger banking start-ups will be in a better competitive position with larger banks as partners, and vice versa. With the number of partnership announcements made around Money2020 Europe, the industry is clearly turning to maturity and scalability through collaboration. In the 82-page Digital Banking Report, The Challenger Bank Battlefield, a broad array of new fintech players were evaluated, with the objective of understanding the trends, must-have attributes and potential paths of evolution in this space. We found that, despite the number of players, the rationale for getting into business, underlying strategies and products offered varied widely. As an update to the competitive matrix, below is the latest version of the Digital Banking Report/Burnmark challenger bank quadrant that looks at the relative market and product strengths of established challenger banks. We revised matrix used a unique approach, crowdsourcing ratings from fintech influencers familiar with the challenger banks. We then used the ratings to place the challenger banks across the quadrants. 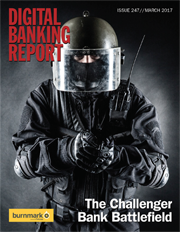 The Challenger Bank Battlefield report provides insight into more than 30 fintech challenger banking organization globally. Beyond a review of the strategies and products offered, this report includes an analysis of the competitive positioning of the organizations reviewed. The report also includes interviews with challenger banking organization founders and financial services industry leaders. The report has 82 pages of analysis and 15 charts/graphs. Finally, the report includes secondary research into the competitive marketplace and guest articles from organizations who are close to those organizations involved. You can download an executive summary of this Digital Banking Report or order a copy of the report by clicking here. This report is not intended to provide a review of all of the challenger banks in the marketplace. With new entities being developed daily, this would be impossible. The report is intended to provide a helpful overview of players and strategies. 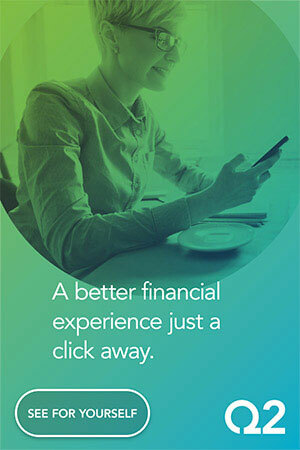 This Digital Banking Report was developed in partnership with Devie Mohan, President and CEO at Burnmark.